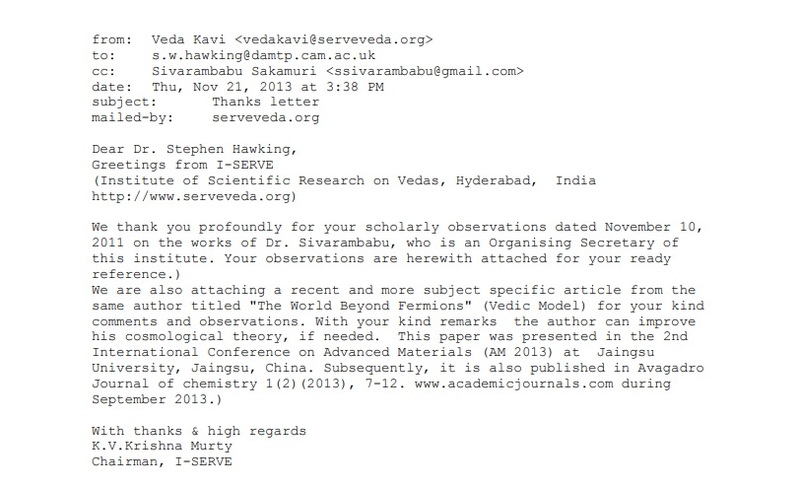 India’s science minister says the late Stephen Hawking said the Vedas had a theory superior to Einstein’s E=mc2. The source? A Facebook fan page. 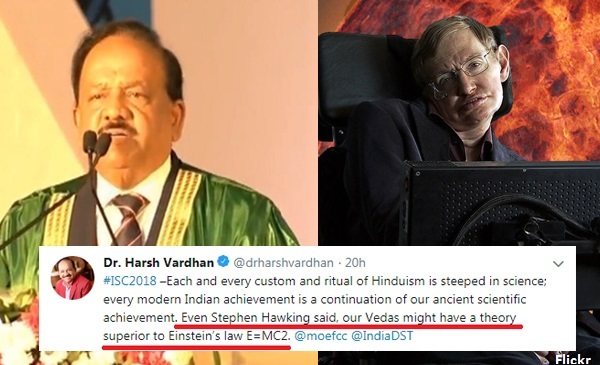 Netizens and journalists were dumbfounded and wanting for answers on Friday when India’s science and technology minister said the late physicist and author Stephen Hawking said the Vedas might have a theory superior to Albert Einstein’s equation of E = mc2. The Union Minister for Science & Technology, Earth Sciences, Environment, Forests and Climate Change, Dr Harsh Vardhan made the following claim on record during his inaugural address to the Indian Science Congress in Manipur on Friday. According to news reports Dr. Vardhan did not provide any evidence to support his claim when questioned by journalists. 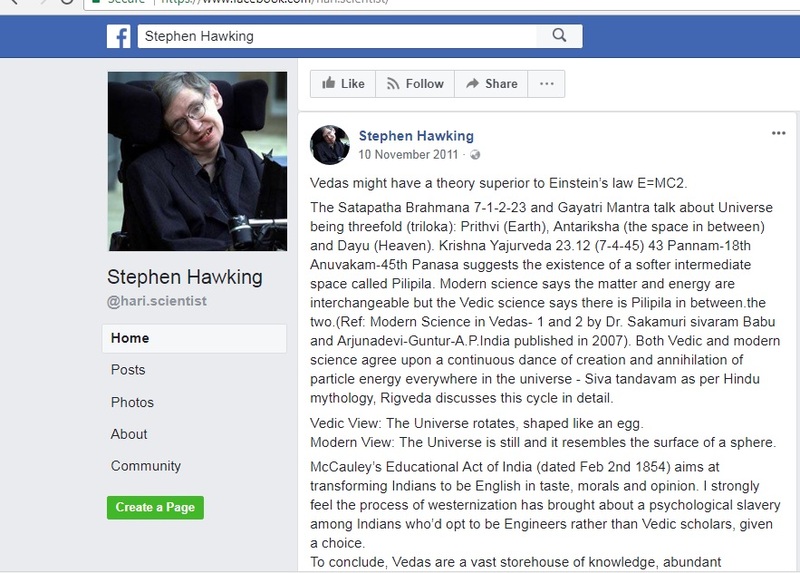 Before Friday, the only combined reference to Stephen Hawking and the Vedas on the Internet existed on two pages – a fake Stephen Hawking Facebook page run by the handle @hari.scientist and a Hyderabad-headquartered Institute of Scientific Research on Vedas, which believed the Facebook page to be genuine. Even as early as 4 years ago, the November 2011 post sparked angry comments calling out the page as fake to which the admin @hari.scientist admitted it was not a real account. At the time of writing this story, the fake page was followed by little over 1500 on Facebook. Other posts from the fake page include just ‘hai’. A message to the fake Facebook page on Friday, went unanswered. 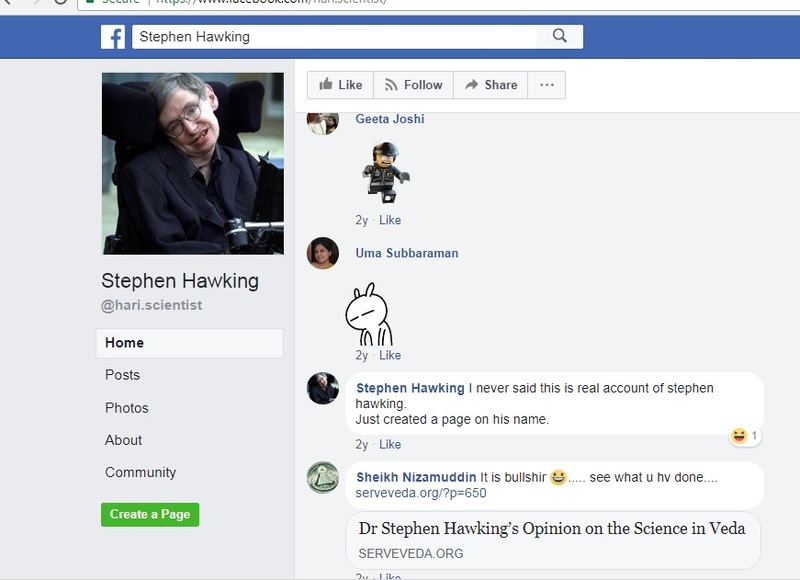 The real Stephen Hawking who passed away on March 14, 2018 at the age of 76 has a verified page on Facebook with about 4.4 million followers. And the automated reply it received. 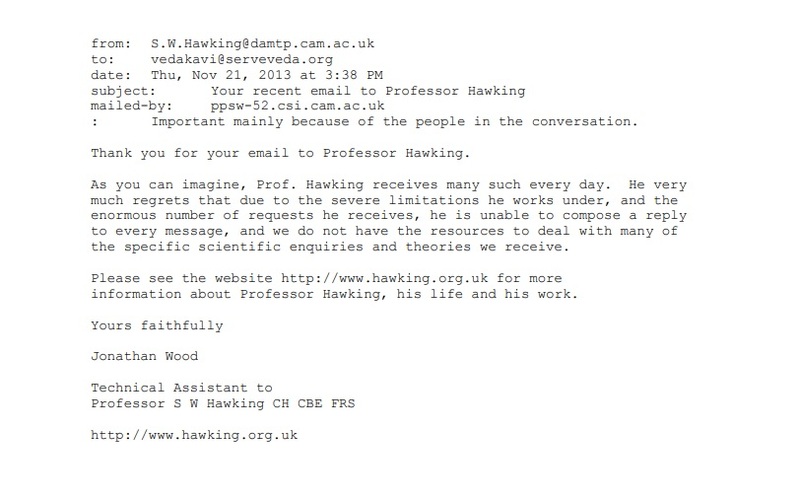 The email was signed off by Jonathan Wood, technical assistant to Professor Hawking. BOOM has reached out to the University of Cambridge to verify various claims and will update this story upon receiving a reply. In his last visit to India in 2001, Hawking delivered a talk titled “Predicting the Future: from Astrology to Black Holes,” in Delhi. In it, the British physicist debunked astrology along with some of Albert Einstein’s theories. 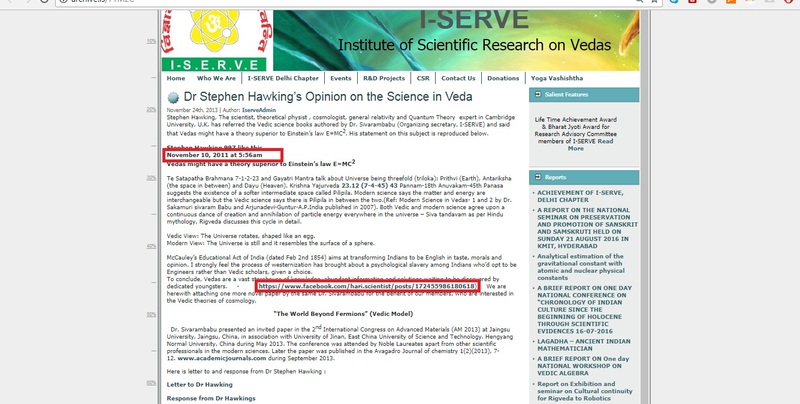 From there on most of the references to Stephen Hawking on blogs dedicated to the Vedas were rebuttals from Indians who disagreed with his views on astrology. Stephen Hawking, theoretical physicist and author is inarguably one of the greatest scientific minds of our generation. Hawking who was on a quest to unlock complex mysteries of the universe was also a testimony to the power of the human mind by overcoming a debilitating motor neuron disease. His death has been mourned not just by the scientific community but by a global audience inspired by his work and life.